We’re back to handing out report cards for the Cowboys past season. Draft: six of the ten were drafted by the Cowboys. There’s a first rounder, two seconds, two thirds and a fourth. “Bargain bin free agency”: the four other members of this group all were signed as free agents after making another team’s roster or practice squad. None were expensive and yet we’ll see this group contributed. 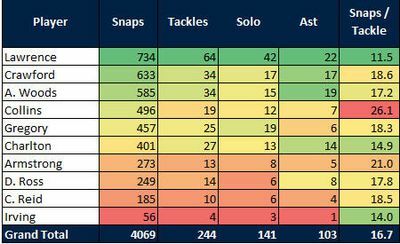 Get used to seeing what we see above play out in multiple ways of this review: DeMarcus Lawrence with absolute dominating numbers. His numbers in every category outclass every other member of the group by a significant margin. Lawrence is widely - and rightly - regarded as an elite talent. What showed up in my review is he’s one of the few top-tier edge rushers in the league who’s also an unrelenting force in the run game. This isn’t news, but it’s noteworthy. We also see one of those “bargain bin” FA pickups recorded the third most snaps on the line. Antwaun Woods came from nowhere to take a stranglehold on an interior DT position. The Cowboys had repeatedly tried to fill the position with similar low-cost acquisitions; Woods was the one time they finally hit on such a player. His interior play was an unexpected surprise. Tyrone Crawford with another consistent, workmanlike effort. Maliek Collins providing another reliable but not spectacular season. Randy Gregory flashing glimpses of greatness in a limited role. He progressed more as the season went on. A second disappointing season for Taco Charlton. Some remind us that Lawrence was disappointing his first two seasons. But he made plays (8 sacks his second year) and flashed potential. Charlton has never really looked like a regular-down NFL player and he’ll be facing scrutiny going into his third year. And here we see the true greatness of DeMarcus Lawrence. Not only did he record the most splash plays, his number was twice as high as second place Tyrone Crawford. In addition, he filled just about every category (in fact, he did record a fourth-down stop against New Orleans but Sturm didn’t record it that way and I’m using his data). He’s the only player on the team to force a fumble, recover a fumble, record an interception, a sack and a tackle for loss. After that you have the rest of the regulars contributing between 10 (Charlton) and Collins (15). Note Charlton and Gregory’s numbers are close, but most of Gregory’s were sacks. Also note another bargain-bin acquisition, Daniel Ross, with the second best snaps/splash play number (behind Lawrence, of course). And again Lawrence shows up in a big way. His 51.5 splash points is 30 points (58%) higher than Crawford’s 21.0 number. We’re going to see, Lawrence made a lot of big plays. The rest of the group can best be described as good - not great, not terrible - but good. This group had the potential to be outstanding. 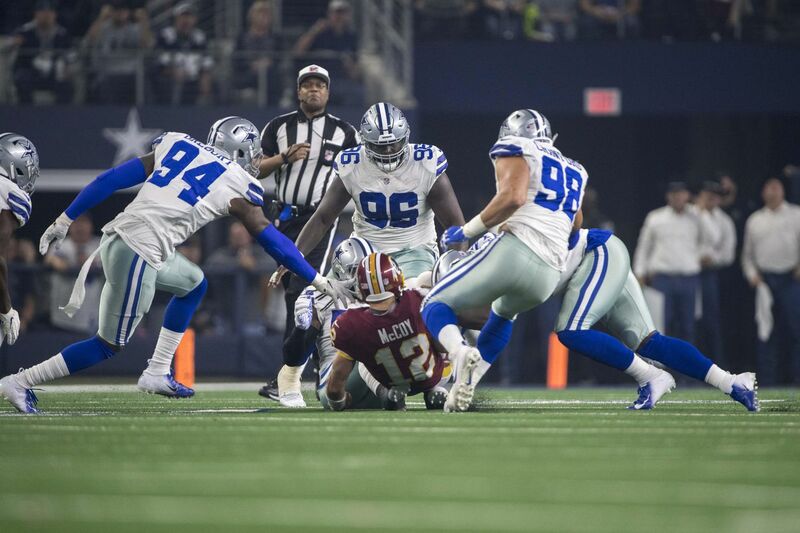 Had David Irving been able to get on and stay on the field this could have been a special group. But suspension, injury and personal issues derailed yet another year for the youngster. He’s likely played his last snap as a Dallas Cowboy. While DeMarcus Lawrence didn't have any sacks, he was still the most disruptive lineman yesterday. Made multiple insane plays against the run, effected the QB on a few passes, and ate up double's all night. Randy Gregory's 2nd sack of the season vs Jason Peters. RG uses a pure speed rush to speed skate around the edge & bring down Wentz. We see the team has invested quite a bit of draft resources in this group, but mostly within the “second tier” of draft investments. There’s no top 10 or even top 25 picks here. But here’s a lot of picks between the 28th pick (Charlton) and the 81st pick (Tyrone Crawford). Those five draft picks recorded a combined 67% of the DL snaps and each played on at least 39% of defensive snaps. The only other “regular” was Antwaun Woods. We also see the value of having young players on their first contract and the value of having bargain bin investments make valuable contributions. There’s no exorbitant, onerous salaries in this group. The most highly paid are the best, most reliable players. There’s minor cost in the rotation pieces. Only David Irving could be seen as a waste of money. Based upon this we’d say the Cowboys had one high quality starter, three meh starters and a group of rotation-players. And I’d be fine with that except Tank Lawrence was better than a “high quality” starter; I doubt many would argue he didn’t deserve his second Pro Bowl honor and was nearly as disruptive as his 1st-Team All-Pro 2017 season. We see similar trends as we saw for the linebacking group. A good start, a struggle during games 3 through 7 then a sustained level of play through the second game against Philadelphia. But after that the group often struggled. Only once (playoff game against Seattle) did this group record a grade higher than a C. Against both Indianapolis and the Los Angeles Rams they were wholly ineffective, unable to ever stop the opposing offenses. It was a surprising and disappointing development after what had been a solid 13 weeks of football. I guessed at Lawrence’s cap hit number next year on the above table; it could be higher if they want to front-load it. What I can’t imagine is Lawrence not being a Cowboy. He is the definition of the player who has earned a second contract; if you’re not willing to pay top money for a player of this caliber in his prime I can’t imagine an edge rusher they would be willing to pay. After that the only big question is Tyrone Crawford; he’s entering the next-to-last year on his long-term deal. He’ll cost $10.1M next season, and he’s probably worth it. He’s been a constant contributor and the team saves only $5.9M if cut so I’m assuming he returns. 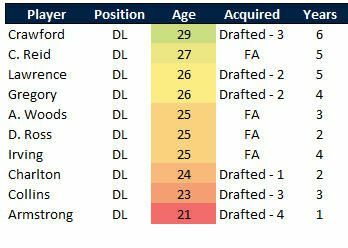 Most of the rest are all either on rookie deals or the second season of a very cost-friendly, bargain-bin free agent contract (Woods); they’ll all return. Caraun Reid could return, depends what his market looks like. I assume Daniel Ross will also be back under his restricted status. 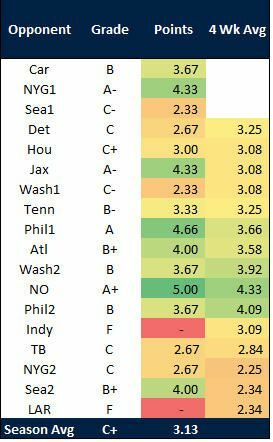 You can see how well the overall defense performed during that stretch starting and ending with the two Eagles games. You also see a disheartening decline over the last weeks of the season. Note how the team spent the fewest dollars in the league on the secondary, but 10th and 13th on the DL and LB groups. 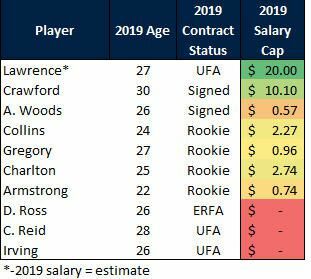 That will likely change, as the cost of the LBers will likely go down (Sean Lee) and the cost of the secondary will go up (Byron Jones - likely). Next we’ll turn to the offensive side of the ball, looking at the tight end group.